Teach them the techniques you use to remember all of your items and create your list. When considering how long each task will take, share your thoughts. As you prioritize the list, teach them the logic you use and the importance of the task itself. 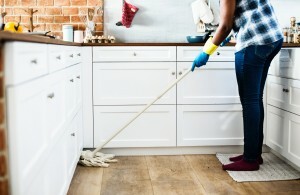 When putting it all together, show them how you get the most cleaning out of the time and resources you have available. This is a great time-management lesson and also provides a framework for students to use to help manage competing school priorities. For a more basic lesson, your refrigerator, couch, and other large furniture items can help. This year, instead of simply sliding your large items around a few feet to accommodate your cleaning, have your student measure the items and find a suitable temporary replacement. Once they are comfortable with this, remove the step of measuring and boost their visual-spatial awareness. If your student struggles to prepare for exams or they need more homework help than you can provide, one-to-one tutoring in Navarre can help. Find out more about the benefits of tutoring in Navarre during your free initial diagnostic assessment at The Tutoring Center, Navarre. Call 850-939-5384 today to learn more.